The car plug-in device adds 3G cellular for ubiquitous tracking of mileage, performance, and crashes. Automatic started life as a driving-improvement device. The compact doohickey plugs into an industry-standard ODB-II port, which, in 1996, became a mandatory interface for most American cars. The first version of Automatic required a Bluetooth connection to a smartphone present in the car, and the adapter tweedled one of three tones to help you reduce gas-wasting practices, like hard stops. The second generation added GPS, to track your journeys when a paired smartphone wasn’t on board, but still required a phone and Bluetooth to sync up later. The third and latest model, dubbed [Automatic Pro](https://www.automatic.com/pro/) ($130) adds 3G cellular and untethers the device, while shedding many of the features of the two earlier versions—at least in its initial firmware and smartphone app releases. It no longer pings when you brake suddenly, for instance. It also uses an entirely new, separate app, also called Automatic Pro, available for both iOS 9 and later (iPhone 5 or later) and most smartphones that run Android 5.0 or later. The company has gone all in, too: the previous generation adapter is no longer for sale. The adapter has evolved into a more of a hub/platform combo, still providing driving reports (via the web app only), but now adding phone-free tracking as well as continuing to promote integration with dozens of apps and services, including the popular IFTTT site that ties together disparate services into triggered sequences. These apps are more useful with an always-available data feed. 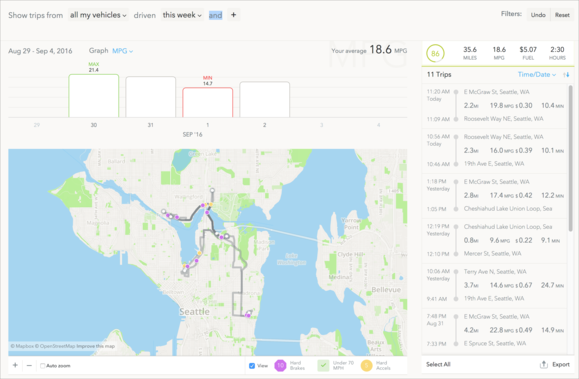 The web dashboard provides a greater overview of driving and habits all at once, but can drill down to individual trips, too. I’ve owned each generation and used the previous two extensively; the cellular connection bumps it into a different category of device, by providing continuous cloud access (at least in areas with cellular coverage). It doesn’t quite turn your entire car into a rolling platform, but it does let you integrate your car into life and expense tracking and smart-home appliances. However, Automatic is still a niche product. It has to scratch a persistent itch or solve a problem that recurs for you. If so, you might find it worth the $130 price tag, which includes five years of unlimited 3G network connections. For many people, there may not be enough of a reward. You can set the adapter to notify you via its app, but this works even if you’re nowhere near the car. You can think of Automatic as opening up your car computer’s data feed to outside inspection and analysis. While the Automatic Pro doesn’t let you fiddle with car settings or remotely arm or disarm your car or lock or unlock (those options aren’t available through the diagnostic interface), it does extract and make available every bit of information that’s emitted over the car’s data pathway, and then combines it for your utility. The basic function tracks your car’s location, marking the beginning and end of trips. 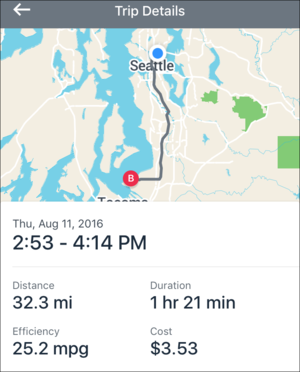 While previous releases included a “brief stop” function that would combine stopovers into a single journey, the new app treats even a drive of a couple of blocks as a separate event. Trip Details reveals statistics for a trip, including estimated cost based on fill-ups and mpg. If you travel for work and can or have to expense trips, if you have kids who drive, or you share rides and need to divvy up gas and maintenance costs, this basic feature can be enhanced with third-party apps. There are both conduits to expense systems and standalone apps you can connect. 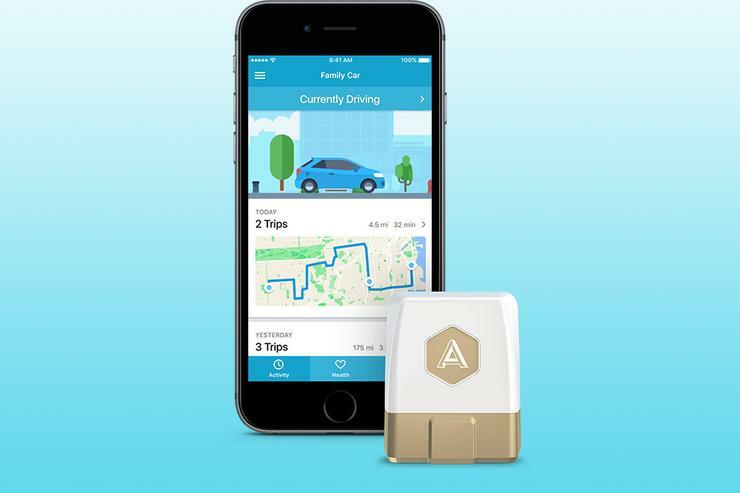 Automatic offers License+ at no cost to train young drivers into good habit with rewards and badges, while also giving insight into a paired Coach partner who can check on progress. It also offers UnMooch, a cost-splitting app for trips that links with Venmo to handle payments. The “check engine” goes on in many cars for a huge spectrum of problems. The app decodes mysterious codes and lights, possibly saving a trip to the mechanic, or at least giving you information to make the decision about a recommended repair. You can also turn off the light function, pretty much the only signal that can be sent back. Crash alert features as also included, something found in many cellular-equipped car systems, like OnStar. The adapter is always tracking speed and can identify a sudden stop. 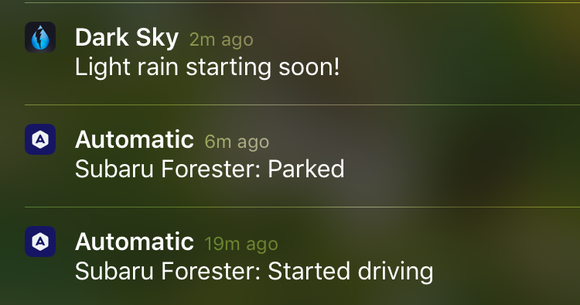 With the feature enabled, the app notifies a driver, who can cancel the alert. If it’s not canceled, an Automatic agent calls and if they get no response, will call emergency services and any emergency contacts associated with the vehicle. If the driver answers, they can also ask to have emergency services dispatched. The adapter has to remain functioning and have a cellular connection, and you have to be at the cell number associated with your account. With fully integrated car systems, an operator can talk through the car—no phone required. The big marketing point for the earlier Automatic adapters were three distinct audio tone patterns that went off when you accelerated suddenly, braked suddenly, or exceeded 70 mph. The tones were designed to help you reform, and reduce gas usage—back when gas topped $4 a gallon. While you can still see how you’re doing in the web app’s dashboard, the new adapter doesn’t make the tones and the smartphone app doesn’t show detailed performance. I feel like the tones did retrain me from a moderately gas-savvy driver to a better one, but I have to think it didn’t play out as a sales point for most drivers. The best new fundamental feature is the adapter uncoupling tracking from a phone. Even with the GPS-equipped second-generation Automatic, at least one smartphone had to be paired with the Bluetooth connection and be nearby on a regular basis to sync and upload travel information. Many drivers of the same car can receive information about a single adapter wherever it is. 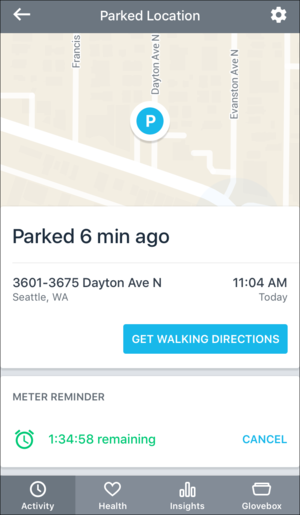 A handy feature is a view that marks your parked location and lets you set a meter timer and snap a photo. No third-party app required. However, if you live or travel regularly in an area in which Automatic’s cellular partner, Telefonica, doesn’t offer robust or any coverage, you’ll find yourself stymied. My colleague at [TidBITS](http://tidbits.com), Josh Centers, lives in an area of Tennessee with only Verizon coverage, no AT&T or other GSM providers. In his case, the adapter only uploads trips when he drives into a covered area. Automatic says no coverage map is available. The firm wouldn’t comment on future plans to use an apparent internal Bluetooth radio to allow off-cellular syncing. There’s also a privacy aspect of Automatic Pro that I discussed with my wife before installing the adapter—and had forgotten to think of when I’d installed the previous version with GPS support. Even in a loving, supportive, frank relationship, other people may prefer their whereabouts aren’t continuously available; it functions much like sharing your location continuously via Find My Friends, only limited to a car. Consider that discussion if you’re not the only person who uses your car, although this is a plus if your kids use it, too. Automatic doesn’t trumpet car location as a way to aid in your car’s recovery, because the adapter can be removed easily. When my wife and I had a car stolen in Seattle, the thieves had some point pulled out every protruding item from under the dash, including the Automatic adapter and something related to the electrical system. Ostensibly the word is out among the fast and the furious. Integrated car cellular systems can’t be so easily disabled. 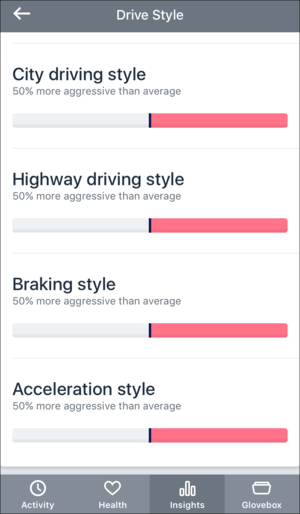 The new Drive Style report in the app is less detailed and seemingly, after hundreds of miles of driving, not very effective yet. And if you’re relying on it to closely track gas costs, you should know that Automatic has to approximate gas usage—the car interface doesn’t provide precise gas-tank level information. With a 2012 Honda Fit, my wife and I have tracked with previous adapters whether the mile-per-gallon calculation was accurate: no two of the car’s trip odometer, Automatic’s gas usage, and my wife’s carefully logged figures agree. Automatic relies on a combination of engine load and mass air flow (receiving as data over the car interface) or manifold absolute pressure. It’s an approximation, and it’s likely a different formula than a car uses, which is based off the odometer. The difference for us significant: we’ve seen as much as a 10 mpg between the trip odometer and gas station gauge calculation and Automatic; the Fit itself reports in the middle. I haven’t yet driven several hundred miles with the Automatic Pro, so I can’t determine how well it’s algorithm performs, and it may have improved, but the fundamental measurement limitations remain the same. Automatic Pro has a lot of different features that might appeal. If you’re looking for detailed, continuous location tracking, whether for general knowledge, expense reporting, or keeping tabs on kids, the flat price of $130 with five years of 3G service is probably enough. For other people, the ability to link apps like Harry’s LapTimer (for racing) or DashCommand (to expose more performance characteristics) could do the trick. But if you’re not worried about where you drive your car, how much you spend on gas, or what it’s doing without you in it, dropping a pin in Apple’s Maps app might suffice.